This rare postcard is a is a view down Elms Drive from Cradock Drive, looking towards Meeting Street, in either the late 1930s or early 1940s. The house on the left is 15 Elms Drive and all the houses on this side of the road can be seen as far down as the final semi, ie number 1. The road was originally not ‘made-up’, ie it was left unadopted. Chris Sharp, who used to live at 17 Warwick Avenue, remembers it being made up and adopted by the local council in 1967/68. The car is a Morris Eight or Morris Ten and dates from about 1938. Note how it is parked right next to the front garden fence and there is no pavement. 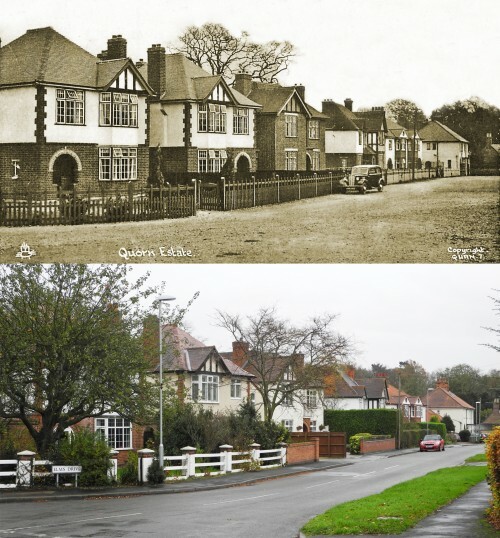 Elms Drive is one of several streets on the south side of the old A6, off Meeting Street, which were created in the 1920s and 1930s, from land previously owned by John Davys Cradock as part of his Quorn Court estate. The builders, John Thomson and George Gamble of Quorn, started building on Spinney Drive in 1927, and went on to build Cradock Drive, Elms Drive (1935), Beacon Avenue (1937/38) and the first part of Warwick Avenue. Missing information: Do you know what year these streets were made-up/adopted?